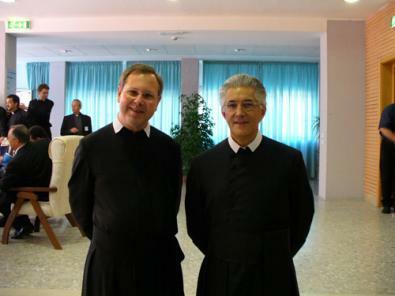 The 25th anniversary of your priestly ordination is a proper occasion to send you the most fraternal felicitations and also to thank you for the work which you perform in presiding over the Permanent Depuation of the Oratorian Confederation. I unite myself with your joy in singing "Te Deum" for the gift of the priesthood: "Gift and mystery" as was so splendidly affirmed by the Servant of God Pope John Paul II. Your joy is certainly deepened by the celebration of the Year of Priests given to us by His Holiness Pope Benedict XVI. It is the realization of the radical fidelity of Christ that makes possible our own faithfulness and you will also be encouraged by the forthcoming Beatification of the Venerable Cardinal John Henry Newman, founder of the English Oratory and by the celebration of the third centenary of the death of our Blessed Sebastian Valfrè (of the Turin Oratory). Blessed Sebastian was the first of St Philip's disciples to be raised to the glory of the altars, and he will be solemnly remembered in Turin on 30th January as well as receiving veneration in all our Congregations as we follow him in our Oratorian vocation. In the light of these great events which our Lord gives us the joy of celebrating, I offer you, dearest Father, best wishes as they joyfully occur, and I invoke for you from the Child of Bethlehem, by the intercession of the most Blessed Virgin and all the saints, the gift of a new stage in your priestly ministry and the joy of a renewed devotion.